St Bloggie de Riviere: Why Flow? Today I was looking into flowcharts. They are singularly tedious things designed, I think, to appeal to the more autistic of human characteristics. I can just imagine earnest assistant managers poring over their newly downloaded flowchart software gazing lovingly at the boxes, diamonds and oval shapes, and trying to fix a round word into a square hole in the pursuit of Order. It's not that I've got anything against Order (or method or discipline), but flowcharts have an unfortunate tendency to conjure up images of managerial mumbo jumbo, smartarses like David Miliband (bet he loves them) and an ambient temperature of irritation. You have to admit, that's pretty cool. Nice one, Love all this. Why was I looking at flowcharts when I obviously have an irrational objection to them? Well, it was all in a good cause, in the pursuit of writing an educational resource. I believe that when I'm writing extra material for something it should be mind-broadening, preferably elitist and definitely with a total disregard for pc fads, drawing on culture and general knowledge. Technically I'm not sure that either of your examples are really flow charts. Not that it really matters. 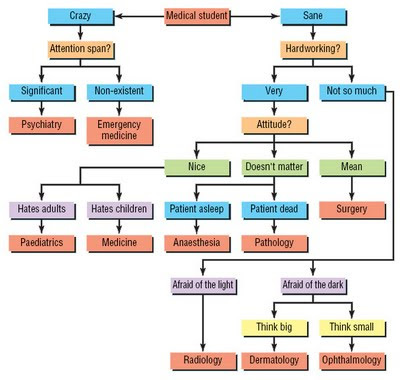 The second I would call a decision tree. In a decision making process, unless the choices are trivial, you need a wall to represent the complexity. I strongly suspect that many of the stupidities of legeslation in the UK are because they are framed in words and not as decision trees where at a glance one could see the missed and edge cases. Anyway that's enough huffing and puffing for one night. 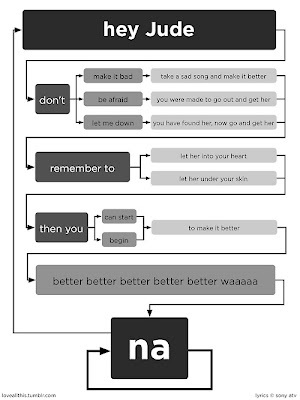 Nick, you're absolutely right about the fundamental use of flow charts. Actually, I was just having a bit of fun re nerdy assistant managers, because I have an over-active imagination and a deep suspicion of management fads. I didn't know about the shuttle disaster - amazing!